Young Men. . . . .
More tragic news about a school shooting in Oregon State yesterday. The shooter was described as a loner, living with his mother, uncomfortable with people, and seen wearying the same army clothes day in and day out. He shall remain nameless on my site. He was 26 years old. A commentator said that all, the too recent shooters, had one thing in common besides the guns, not personality or family situation, not mental illness, but all were in their late teens to early to mid 20s. The shooter in Oregon is being investigated and his computer use is under scrutiny as I type, so enough about him. My thoughts and prayers are for the survivors and families of the victims. This situation made me think about two young men in the same age group with very different stories. 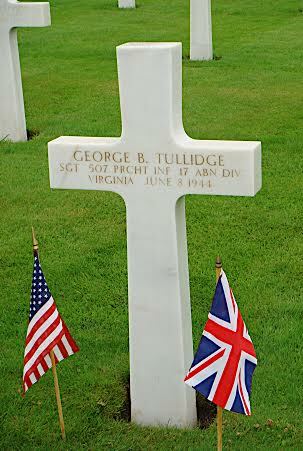 One is my brother George Tullidge whom some may remember. If not , I am including my post on the brother who jumped into France the night before D-Day. He died 3 days later on a ship returning to England. 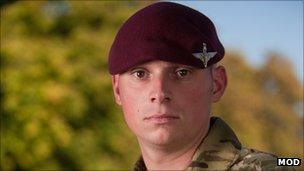 A Cambridgeshire soldier described as “the bravest of the brave” is to receive the Military Cross. Cpl Martin Windmill, of 2nd Battalion The Parachute Regiment, was honoured for maintaining command and taking enemy positions despite being injured. He was second in command of a unit operating in Nahr-e Saraj in Afghanistan in December, when his team came under fire from insurgents. Cpl Windmill suffered shrapnel wounds, but continued fighting for four hours. However, he made the decision not to risk the safety of others by calling in a rescue helicopter. “In those situations it’s hard to call in a helicopter,” Cpl Windmill said. He added: “Those sorts of things are done every day out there. “I don’t like the term ‘bravest of the brave’ to be used, really. Obviously lots of other guys have got some really serious injuries and others have been killed. Cpl Windmill, who comes from Cambridgeshire, is one of 16 soldiers to receive the Military Cross in recognition of service during operations carried out between October 2010 and March 2011. Three young men all around the same age, all had guns or weapons which they used. For me, Martin and George were serving their countries and fighting against fascism and terror. The shooter in Oregon caused terror. I value your opinions, blogger friends! Addition: I just heard of a hero yesterday in Oregon, ironically a veteran who is home now and was attending the college. He protected others by blocking a door and in the action , he was shot 5 times. Thankfully, this young man is recovering and will go home to his 6 year old son as a hero! This entry was posted in Uncategorized, USA and tagged A Paratrooper's Faith, Afghanistan, anger, bravery, Cambridgeshire, Corporal Martin Windmill, Geprge B Tullidge III, guns, Hero, Military Cross, Normandy, paratrooper, shooting in Oregon Community College, Young men. Bookmark the permalink. 33 Responses to Young Men. . . . . Although I would have preferred to not have the nut case in Oregon mentioned, I will be reblogging this post for George and Martin tomorrow as I promised. Thanks, I agree. It. Does gives pause and great appreciation for those young heroes! This hate-filled young man (27) spent one month in basic training before the Army dismissed him. The Army saw something unstable about him. Why didn’t his friends and family who supplied him with guns see the same thing? Yesterday’s massacre in Oregon is the 45th shooting on school campuses in 2015. It is the 142 school shooting since Sandy Hook. And nothing was done. We average 36 people per day that are killed by guns in all shootings. The biggest source of killing is because of domestic violence. To date in 2015 there have been 9,900 deaths by guns, and almost 20,000 more injured. Thank you for your thoughtful response and startling statistics ! This intro leads us into an article of courage and honor. I would also like to add Koji’s link on a hero…. I have enormous regard for George Tullidge and for Martin Windmill. They,and Chris Mintz, have bravery beyond my experience. The third young man though, and all his predecessors, are going to need careful examination very soon or such tragedies will become so frequent that they are not even reported, as happens with fatal road accidents nowadays. In the USA the only way to stop it will be to prevent easy access to guns. Good luck with that. We have just the same phenomenon of crazy young loners in England, but with no access to guns, they kill themselves instead. Our suicide rates for young men were published recently, and the UK suicide rate was 11.9 deaths per 100,000 people, an enormous rate, three times that of women. They seemed to vary regionally very slightly, apparently based on the poverty of the regions concerned. Of course, I have no remedy, other than to point out that in our consumer driven, rat race society, very many of our youngsters are so desperately unhappy and are, in actual fact ,getting unhappier! John, many thanks for your thoughtful response. You might like my next post “A Hero! Chris Mintz. Have a lovely weekend! Have you been to the American Cemetery in Cambridge? It is very moving and there is an amazing place to have tea in an apple orchard just across the way. There are pictures of all the renowned authors and artists who came by boat from Cambridge University to relax , share, and have tea under the apple trees! Amazing. . . if you are nearby or worth the journey. I’m not sure if gun control laws recently kicked around carefully by dodgy politicians would have prevented this tragedy. If not, then I’d like to see other kinds of gun control laws considered. But it might take a bit of the courage of some of the men mentioned in this post, for any politician to really push it. Gun control is very tricky in the US. I am sure that you know about the 2 amendment which is very dear to lots of people here. . . . hunters and people wanted to have protection in their home. May sound crazy but it is in our DNA! I lived in Arizona for 7 years where “conceal Carry” was the law. My son said, ” Just assume Mom that everyone is packing!” At first that made me feel uneasy but soon I felt safe knowing if something happened that someone would be there to put an end to it. New York, my residence now, is a far time and cry from Arizona! Thanks for the comment. I don’t mind if someone is packing, as long as they are sane. But if someone opens up on a large crowd, with an assault rifle, I hope the sane people who are packing are carrying machine guns. if everyone is carrying, and a lone nutter starts killing folks then surely there may be enough public-spirited citizens around to end it? ‘Compulsory-carry’ for everyone makes better sense than disarming everyone. The nutters will always (r) always have guns; and waiting for the nice policeman to turn up with a gun sounds a bit … optimistic. I wish we didn’t live in such a violent world, Argus, but I am thinking you are right! I think I would like New Zealand. Love your spirit! There are more fatalities on the highways in most states than from guns. Does that mean we should quit driving cars? Excellent reminder and great question! I’m sorry for the death of your brother, so sad, and it must have been such a surreal experience. I’m thankful for his service. And I’m grateful to Cpl. Windmill. Courage in the midst of the storm shows how dedicated he is to his country. The Oregon shooter, I agree, let’s put aside his name. Now, if we could just get the media to utilize the fundamentals of journalism, rather than digging into the deep and dirty well of sensationalism. Oh yes I remember real journalists reporting instead of inventing news! Do you think that will return to just news. Thank you for your very kind heartfelt comment! Dear Brad, it’s a different world, a harsh world that we live in. This domestic terrorism is hitting us where it really hurts. Thank you for honoring the young and old brave patriots, My hat is always off to them, and in their memory. I honor your brother. He sure sounds like a hero to me. I also heard that the shooter in Oregon asked the people he shot whether they were Christian or not. If they said yes, he shot them in the head, if not, he shot them in the leg. The tragedy in Oregon is not one that I will easily forget. Many thanks thanks for your kind words. I wrote a post on world Wide persecution of Christians you might want to read. Thanks so much! I don’t think ‘gun control’ will have any marked effect; only ‘gun elimination’ will succeed with this particular aspect of the problem. That is the UK answer, to all intents. It is very difficult to have sole responsibility for a gun in UK – but as another correspondent here indicates, we are trying to cure the symptoms and ignoring the disease. Society has forgotten how to care. The young have gun violence marketed at them every day until it comes to be seen as a solution; and fundamentally there is no room for anyone in distress, or for anyone who does not follow the ‘academic success model’ that dictates how we think our youngsters should grow, and the targets we believe are right for them. There is a long history of gun ownership in the U.S. that is hard for Europeans to understand. I think more stringent background checks may pass. Oregon has strict laws. Chicago had 111 shootings in two weekends and it has very strict gun laws. Thanks for your thoughtful comment! A very disturbing reading, yet one which has to be told, here in Australia, we are experiencing the same lone shooter/wolf scenario with another case two weeks ago, and others opening up. The cause is one which I don’t like stating on Word press, but boils down to a perverted Ideology disguised as a Religion. Isn’t it strange that so many wars and bad things happen in the name of religion. I don’t believe that is what religion should be all about. It should be peaceful and loving. Bev, I know what you mean. There are terrible things done in the name of religion and they seem to be the incidents that make the media. I agree Gypsy Bev, sometimes I wonder if it’s worth advertising our Religious beliefs, maybe our Spirituality should remain between ourselves and our God.